I’m terrible at puzzle games. Fact. I’ve played many and given up before the end of chapter one (sometimes even puzzle one) on more occasions that I would like to admit. They’ve been popping up for years on all formats (including your trusty phones) infact there even on the high street with a rise on the escape room puzzle experiences becoming increasing popular. 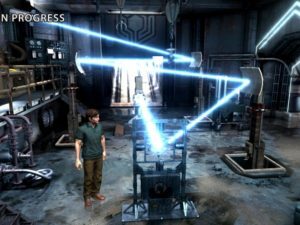 Microids Subject 13 offers a familiar experience, waking up in a small space and having to work out how to escape from increasingly bigger and more challenging rooms. The game does present some fun little mini games and includes many puzzles that on occasion it’s easier to just try all variables that sit and use common sense. (yes I did try all possible permutations on a number puzzle rather than have any idea on what I was doing to complete it.) be to be fair, that says more about me than the game. The game is a port from steam and perhaps was a little rush as the controls are a tad clumsy and very frustrating when to complete some of the games puzzles. on a couple of occasions I opted to do something (anything) else rather than fiddle with the Xbox Controllers analogue sticks. What struck me after the initial room was that little had been put into the look of this game. quite plan rooms and vistas didn’t help liven up what was already a frustrating experience due to the earlier mentioned poor controller implementation. With plenty of games in this genre available these days standing out visually is often the way to ensure you game is memorable. Story: 7/10: With a strong start I got past my initial reticence on how run of the mill theses games can be. however I felt as I spent hours trying to work out the puzzles in this game I felt I was not really finding myself as engrossed as I initially started. getting the balance right with pace of narrative and the challenge is what o helps games such as this prosper. Sound: 5/10: Microids have not spent much time on the sound in the game. For a game you spend a lot of time moving around the same back drops on repeat a decent score could have added to the atmosphere. Replayability: 4/10: Games of this genre have inherently little replay value. If the puzzles had more than way of solving them you find it far too easy. Satisfaction: 6/10: To be completely fair, I got more involved with this game from the off than I have with any other offering in the genre. Unfortunately as time progressed, the poorly executed control system and lack of atmosphere made the game very dull and frustrating as I progressed.